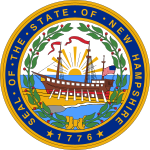 The United States Senate election in New Hampshire was held on November 4, 2008. Incumbent Republican U.S. Senator John E. Sununu ran for re-election to a second term, but was defeated by Democrat Jeanne Shaheen in a rematch of the 2002 election. Shaheen's win ended 30 years of Republican control of this Senate seat. New Hampshire has always been considered an island of conservatism in the Northeast. Following the 2006 election, however, many statewide offices were taken over by Democrats: Representatives Carol Shea-Porter and Paul Hodes, Governor John Lynch, the majority of the New Hampshire Executive Council (a five-member Lt. Gov.-like board), and the majority of both legislative chambers (which had not occurred since 1911). The popularity of the governor could be a factor in the election to Sununu's detriment, yet such speculation is premature. Also, though the state voted for then-Gov. George W. Bush in 2000, Sen. John Kerry narrowly won the state over Bush in 2004. Shaheen, the Democratic choice, at a rally in the lead-up to the election. Astronaut Jay Buckey MD, Portsmouth Mayor Steve Marchand, and Katrina Swett, (wife of former Congressman Richard Swett), had announced their candidacies but withdrew in favor of former governor Jeanne Shaheen upon her entrance into the race. Shaheen had been the Democratic nominee for the race in 2002. Since 2005, Shaheen had served as director of the Institute of Politics at Harvard University's Kennedy School of Government before leaving on September 14, 2007. She had been aggressively courted to run by Senator Ted Kennedy (D-MA) on behalf of Senate Democrats, and by a "Draft Shaheen" campaign led by former New Hampshire Democratic Chairman Kathy Sullivan. The filing deadline for the Democratic and Republican Parties was June 13, 2008. Shaheen filed, as did Raymond Stebbins. A November 2006 SurveyUSA poll of New Hampshire voters found Sununu had a 47% approval rating. A February 1, 2007 poll conducted by the University of New Hampshire found that only 45% of New Hampshire voters held a favorable opinion of Sununu. In June 2007, a poll by 7NEWS and Suffolk University of likely voters reported that only 31 percent in the poll said Sununu deserved re-election, with 47 percent saying that someone else should get his seat. A July 2008 Granite State Poll had Sununu's favorability rating at 52%, his unfavorability rating at 33%, and neutral or undecided by 16%. Shaheen is viewed favorable by 53%, unfavorable by 31% and neutral or undecided by 15%. Senator John McCain, the Republican nominee for president, had mentioned Sununu as a possible running mate for the 2008 presidential election, as well as Lindsey Graham, Bob Riley, Steve Forbes and John Thune. Sununu had said he would remain neutral in the New Hampshire primary. However, McCain selected Alaska governor Sarah Palin instead. Political analyst Chuck Todd said that Sununu was one of the most endangered incumbents, due largely to his continuing support of the President's Iraq policy. Nonpartisan newsletter Larry Sabato's Crystal Ball, following Jeanne Shaheen's entrance into the race, listed the race as "Leans Democratic." CQ Politics also rated the seat as "Leans Democratic". ^ Democratic Party Cumulative Filings Archived June 5, 2011, at the Wayback Machine New Hampshire Secretary of State. Retrieved June 15, 2008. ^ Republican Party Cumulative Filings Archived June 5, 2011, at the Wayback Machine New Hampshire Secretary of State. Retrieved June 15, 2008. This page was last edited on 22 April 2019, at 20:44 (UTC).